After a gorgeous hike around Shibakawa - where I snapped about a zillion more shots of Fuji-San - we packed our stuff and got in the car, this time headed for the small mountain town of Minobu, home to one of the most sacred series of temples in Japanese Buddhism. When we pulled up at the base, I was offered to walk up the stairs, if I would like. Mom opted to go up by car, but being a trooper, I figured I'd do it the right way and hike it. Actually, it's just a new pagoda that's under construction. The set of temples themselves are open, save for one, which isn't quite ready yet. But being in the company of a monk, we were allowed in to see it, on the condition that I'm not allowed to photograph anything inside. Fair enough. Now, I've been to a number of Buddhist temples back at home. They're small, humble affairs tucked into residential neighborhoods, for use by the paltry number of practicing Buddhists. This is not one of those. It's huge. It's lavish. It rivals most Japanese castles in its enormity and the amount of wood and paper and gold used in the construction. Absolutely stunning. Of course, it casts Buddhism in a whole new light for me. Whereas before I always thought it was a religion founded on a humble and simple background, seeing Ken's worldly possessions and then this - a temple to rival Europe's cathedrals - makes me believe that even this creed, while kindler and gentler in its rhetoric, pumps a lot of money through its coffers. A hell of a lot. But people have to have their beliefs, and if you're going to have one of the most sacred sites in all of Japan, you may as well do it up. The place is sacred because the first Buddhist monk in Japan - the gentleman responsible for bringing the religion over from India and China - made his life and his resting place here. 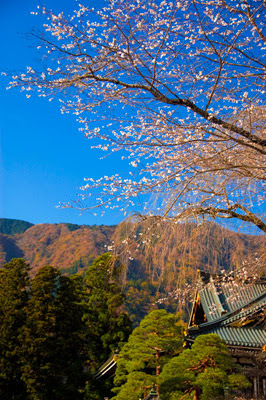 With that kind of sacred power, it's only at a place like this where you can see the sakura (cherry blossom), strictly a springtime phenomenon, alongside autumn foliage. It's absolutely surreal, and technically speaking, more or less impossible. The freaky part is that I only saw this right in front of the temple dedicated to him, and in front of his place of burial.